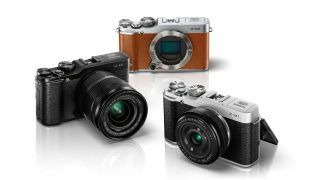 Fujifilm has introduced another compact system camera to sit in its lineup of X cameras. The Fuji X-M1 is the third camera in the lineup to feature the 16.3 million pixel APS-C sensor, originally found in the Fuji X-Pro1 and found to challenge some full-frame sensors. The design of the sensor means that moiré patterning and chromatic aberration are kept to a minimum, without the need for an optical low pass filter for increased detail and resolution. Our own lab at TechRadar has found that the Fuji X-Pro1's sensor is capable of resolving more detail than some full-frame sensors, so the fact that Fuji has decided to keep the same sensor for its entry-level type of model sounds promising. The camera also comes equipped with an EXR Processor II, designed for high-speed results, including a start-up time of just 0.5 seconds, a shutter lag of 0.05 seconds and a maximum burst speed of 5.6 frames per second. Specifically designed for shooting one-handed, all of the adjustment buttons and dials on the Fuji X-M1 are positioned on the right-hand side of the camera for easy reach. On the back of the camera is a tiltable, 3-inch LCD screen with a high resolution of 920,000 dots. A built-in flash with a guide number of 7 is included. All of this is in a body that weighs just 330g (11.64oz). Joining the increasing number of cameras equipped with Wi-Fi, the Fuji X-M1 can be used with a free downloadable app to transfer images across to a smartphone or tablet. An Autosave PC function is also included to automatically transfer images across to a PC on the same wireless network for easy backup. Fuji is incorporating several fun features, including Film Simulation modes designed to replicate the look of classic analogue film stock such as Velvia and Provia, along with a number of digital filters such as Toy Camera and Miniature. Also launching alongside the Fuji X-M1 is a new kit lens. The 16-50mm f/3.5-5.6 lens offers an equivalent of 24-76mm in 35mm terms and is designed to be lightweight, to complement the Fuji X-M1's body. Fuji has also announced a 27mm f/2.8 (41mm in 35mm terms) pancake type lens that is compatible with all the cameras in the X interchangeable lens range. Weighing in at just 78g (2.75oz) and measuring only 33mm, this would be another lens ideal for use with the small body of the Fuji X-M1. The Fujifilm X-M1 will be priced at £679 / $799.95 with a kit lens, but it will be available in black, silver and brown.